When I was typing the title to this post, all I could think about was, “Give peas a chance”. A great slogan I saw on a t-shirt at the Asheville VegFest this year. I think peas deserve a chance, especially leftover peas. A chance to be a main dish of a plate. I have always felt that way, even as a child I was happy with a bowl of peas for dinner. If a scoop of mashed potatoes was then added, (especially cheesy mashed potatoes? then that was just ‘icing” on the cake. As much as I loved peas, my brother hated them. Now that I’m looking back I really should have charged my brother half of his allowance for always eating the peas off his plate. He went on to dessert and I was happily full of peas. Yes, my taste buds have always been savory over sweet. Peas seem to have a bad veggie representative. Ever notice the commercials when children are pushing around veggies on their plate out of distaste or refusal to eat, it is usually peas? It can’t be just because they are so easy to roll around a plate. Peas get some bad press at times and I want to cast them in a new role–a leading role as a main dish. If you have a child or grandchild like those in the commercials who refuse to eat peas, this dish just might be the trick. Don’t mention it has peas in it and they will never know-hubby didn’t! Shhhh. 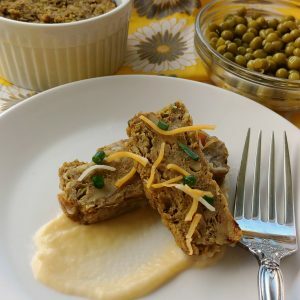 I like to serve this “meat” loaf with a simple cheese sauce, gravy, or mashed potatoes, of course. 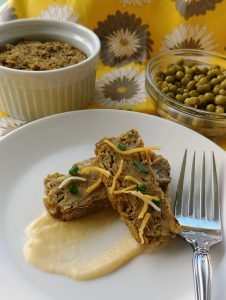 The best part about this recipe is I usually have all ingredients on hand, perfect for a quick “meat” loaf sandwich. If I don’t have any leftover peas, I’ll just open up a can. For those of you who are not meatloaf fans, just think of this as a nice thick veggie burger. You can even serve it on a bun and dress it accordingly. Add leftover peas to a bowl and mash until almost smooth. Mix in bread crumbs, nuts, egg, and milk until well blended. Add mixture to buttered ramekins. Let sit for 10 minutes. Bake for 30 minutes or until firm and lightly brown. Recipe can easily be doubled an put into a small loaf pan.Cook for 40 minutes or until firm and lightly brown. Serves a family of four. Put Your TO COOK IS TO CREATE Thinking Cap On: Think about what seasonings you have in your leftover peas and adjust accordingly. I had onions in mine, so I didn’t add any, but if not, add sauteed onions. No walnuts on hand? Try other nuts like pecans or almonds. No leftover peas? Think about substituting other vegetables or leftover beans. Not a green pea fan like the kids? Substitute black-eyed peas. 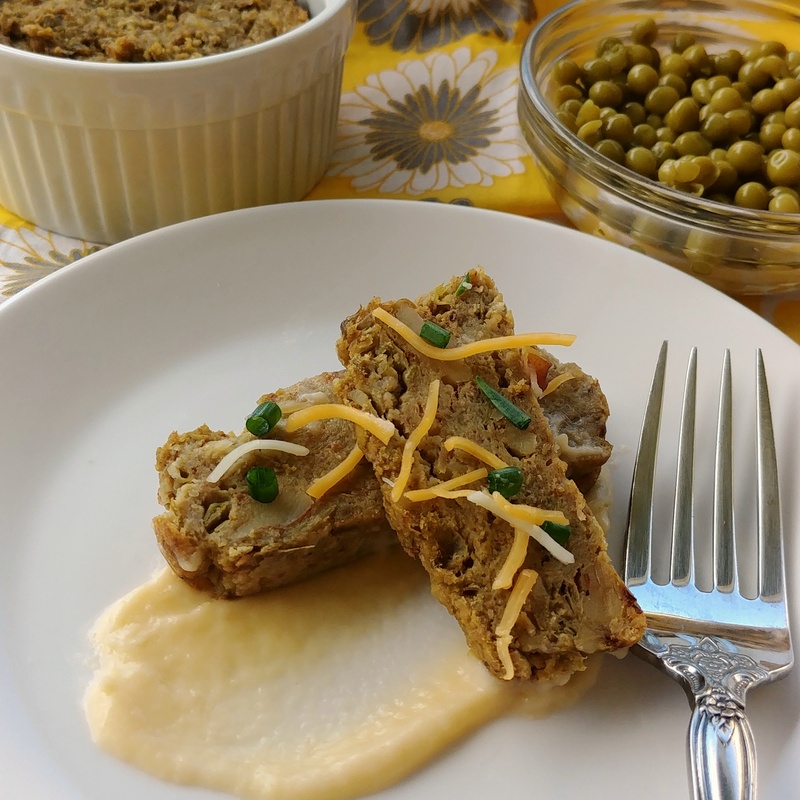 Don’t want to serve your “meat loaf with a cheese sauce or gravy? Think about what you normally serve with a meatloaf. Mashed Potatoes is always a winner for me. Can’t quite pull of a vegetarian meal in your house? Add cooked crumbled bacon or diced ham. Have leftover walnuts? Go ahead and plan tomorrow night’s taco dinner. FOOD FUN: Ever call someone a sweet pea? Think about that term Sweet Pea, a term of endearment for someone sweet and cute. Funny how a vegetable could inspire a term of endearment but not inspire the majority of people to want it on their plate!